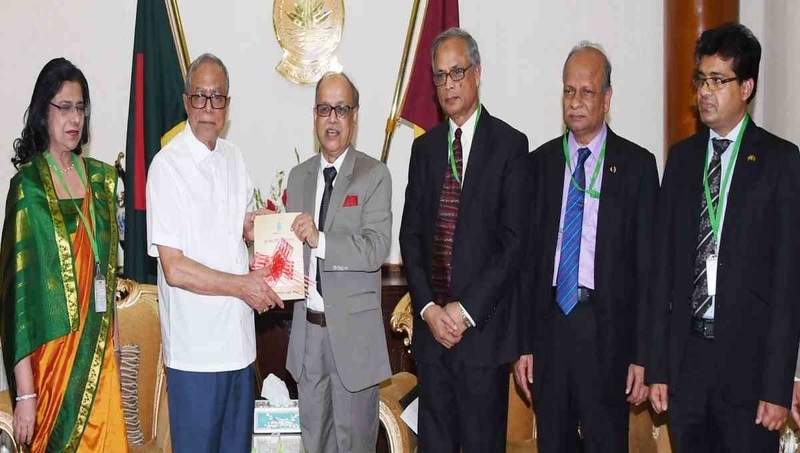 President Abdul Hamid on Thursday asked the University Grants Commission (UGC) to play active role in ensuring the quality of research in higher education. The President said this while a delegation of UGC led by its Chairman Prof Abdul Mannan submitted UGC’s Annual Report-2017 to him at Bangabhaban on Thursday. President’s press secretary said, "During the meeting, the President said that research is very important in the field of higher education. There is no alternative to research to survive in a competitive world. Therefore, the universities should be given priority in the research sector and ensuring the quality of the research. " The UGC Chairman appraised the President about various aspects of the report and informed the President about overall activities of the Commission, especially, development projects and implementation progress. The Chairman said that the allocation for research has been increased. "The allocation for research in 2008-09 fiscal year was Tk 10 crore and 35 lakh while an amount of Tk 73 crore and 30 lakh has been allocated in the fiscal year 2017-18,"he added. He also said that higher training has been given to improve the standard of teachers. The Chairman said that a database called 'Higher Education Management Information System' has been created with huge information from the universities in order to ensure transparency and accountability in academic, administrative and financial management of different universities. The President advised UGC to take necessary steps to ensure the quality of education and good atmosphere for education. Secretaries concerned to the President's Office were present during the meeting.